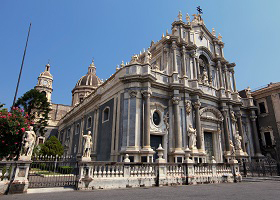 In this fascinating city nestled at the foot of Mount Etna you’ll find a thriving downtown that is not only the active city center, but a historic UNESCO World Heritage Site, combining the best of ancient and modern city style. Your options are as wide as your imagination. Explore the temperamental volcano that has reshaped the city many times, visit the beautiful setting of Taormina where stunning views and beautiful antiquities vie for your attention or the UNESCO site of Tantalica. If you prefer, explore the ancient city of Syracuse, called by Cicero himself “the most beautiful of all,” and another UNESCO site. Pretty Xlendi Bay lies on the west coast of Gozo, an island long thought to be the mythical Ogygia of Homer’s Odyssey. In the story, Calypso fell in love with Odysseus and held him captive for seven years.. The reputed Calypso Cave is just one of several intriguing caves on the island. There’s also Caroline’s Cave, a natural grotto that was once a private swimming hole for nuns. Surprisingly for such a small island, Gozo is home to the oldest freestanding temples in the world, the Ggantija Temples, nestled among the rolling green hills. You should also visit the Citadella, a small, fortified town that houses the island’s Cathedral, the Museum of Archaeology, the Folklore Museum, and the Old Prisons. 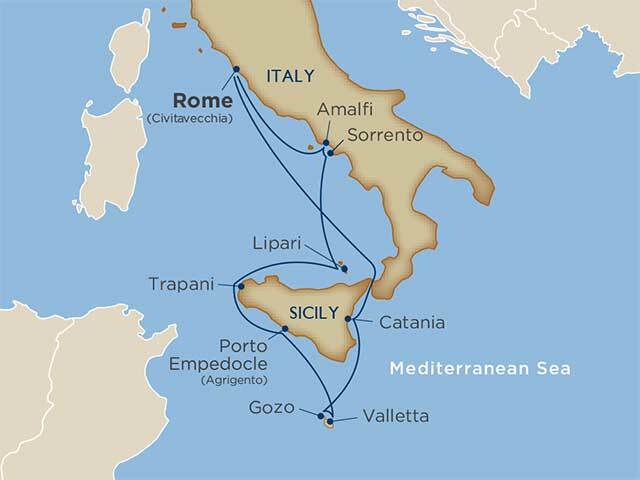 Here you’ll find what are widely acclaimed as the best, ancient ruins in the entire Mediterranean. Imagine the wonders of Athens, of Ephesus, of legendary Olympia itself. 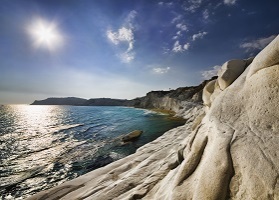 Then imagine them all in one place, at Agrigento, a UNESCO World Heritage Site. As you wander the verdant ridge overlooking the Mediterranean you will be transported to the 5th and 6th centuries. The irresistible scent of olive, almond, and eucalyptus trees will entice you back to the present. This is one of the world’s most beautiful sites. 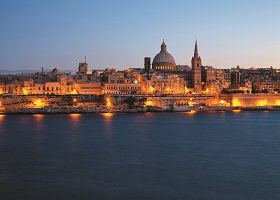 At once ancient and contemporary, Trapani is a city of contrasts. 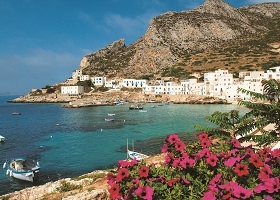 From the salt marshes that produce much of the Mediterranean’s signature colored salts, to the intricate mosaics of Mozia and the famous wines of Marsala, to the best view in all of Sicily from the medieval hill town of Erice where the colorful gardens are rivaled only by the cannolis for pure sensory delight. The line of 17th century windmills, still hard at work in ancient Phoenician salt marshes beckons you to return to Trapani again and again. Take time on shore to explore the beautiful village and enjoy the exclusive access that only a small ship can provide in a port large cruise ships cannot reach. 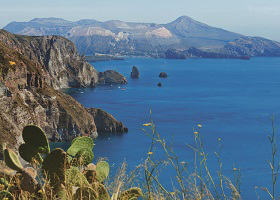 An optional tour will introduce you to the highlights of the largest of the seven Aeolian Islands, well-known for its mythological connections and a UNESCO World Heritage Site. 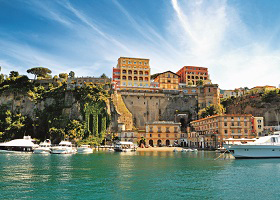 UNESCO World Heritage Sites abound in Sorrento. 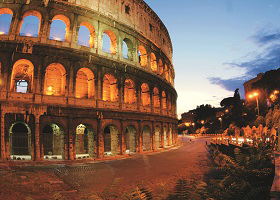 Optional tours will take you to the archaeological areas of Pompeii and Torre Annunziata, or the 4th century B.C. city of Herculaneum. 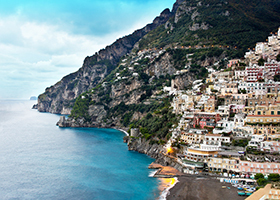 Perhaps your choice will be a boat ride to Positano, the legendary home of the Sirens. Perched on a terrace on the spectacular Amalfi Coast, Sorrento offers exceptional views of the Bay of Naples and Mount Vesuvius.